I was looking into this today as a possible way of adding detail to our monster. If the render time doesn’t get to high I was thinking that this method might work well in conjunction with adding some painted detail. The first image is the base, low resolution mesh that I made in Maya and the second is what I sculpted in Mudbox as a test. I then exported the displacement map from this sculpt back into Maya. At first I forgot to create a subdivision in the MentalRay approximation editor which renders a hard edged result. Turning on the subdivisions creates a smoother render. More subdivisions are needed for more accurate detail (I found 5 was good) and I was afraid this would increase render time but they all took about 50 to 53 seconds. Seeing as we haven’t settled on a monster design yet I painted a random silhouette in this morning that turned into this – it makes me think of a cross between Plankton from SpongeBob and Aku from Samurai Jack. I took some inspiration from One More Beer! for the lighting in this – like the window behind the head and the light from above the monster. Also I’ve been wondering how difficult it would be to create frothy toothpaste in Maya? 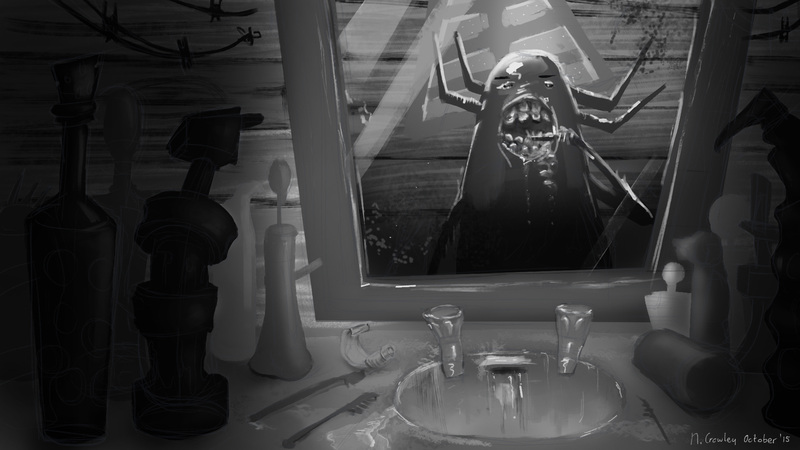 I’m not sure if it would be better to include some of the monster in frame outside the mirror also but we can always play around. I didn’t get a lot done over the weekend on account of the flu but these are some of my progress drawings. I’ve just been trying to figure out the composition so far. I was thinking of either a central composition like in One More Beer! or putting the character to one side and still use lots of monster-toiletries/bottles to lead into the mirror. I’ve also been trying to see what this could look like if it was rendered like a Brian Miller illustration. I watched Adventure Time (2010-) for the first time recently. The expressions are really fun! I was wondering how translatable something like these would be to our monster’s facial rig? It might be fun if the monster’s face contorted into all sorts of expressions between jump cuts. I’m not sure how well this would work alongside the action of brushing teeth also though. I found the work of Brian Miller over the weekend. I really love how graphic his illustrations are and how he uses a grainy texture through his colour. I know this style isn’t the most original in the world but it would remove us a little more from the Monsters, Inc. (2001) look. These are some images from his “Umbrella Factory” and “Popshot Magazine” collections on Behance. I also found this article: “The Greatest Mirror Moments in Movie History” from the Telegraph. The background from Taxi Driver (1976) might be useful for inspiration also. The centered composition works well for the horror tension, like in Occulus (2014), but I also like the composition where the character is framed to the side and reflected in the mirror. 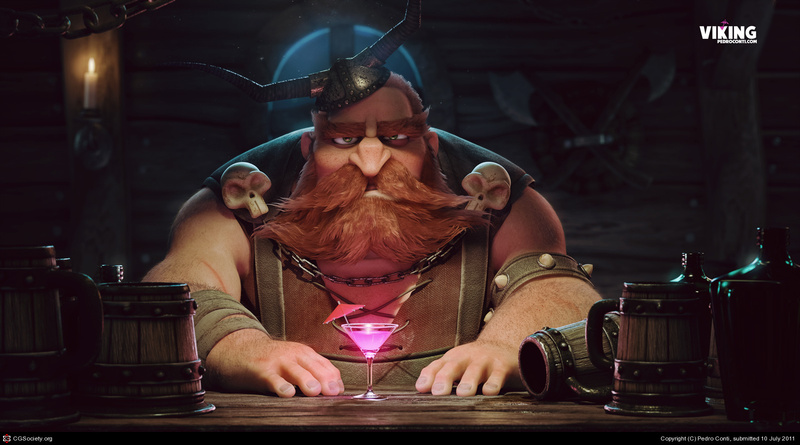 Inspiration: Pedro Conti, One More Beer! This is a video that Katie showed us and it’s probably one of my favourites at the moment for inspiration. I like how the framing is simple through the entire shot – the character takes up most of central frame and is framed by the empty tankards to the side – but the colour, light and character animation look really appealing and support the story. I also found this interview with Pedro Conti that talks a little about the process of making One More Beer!